Carpenter's Cabinet founder Chris Warnick and Holly Pond Office Director Laura Symonds cut the ribbon, officially opening the center for business. HOLLY POND – Chris Warnick is a man who knows what he's talking about when it comes to hunger. Growing up in a family that experienced its own need, Warnick became determined early on to do something about the problem of hunger. Of the task of combating hunger he said, "When I was 12 years old, I made a promise to God that if I was ever financially stable, this is what I would do." He kept that promise, opening a food bank in Falkville in 2010; and now, through a partnership with Lonesome Dove Cowboy Church, that promise has brought him to Holly Pond. 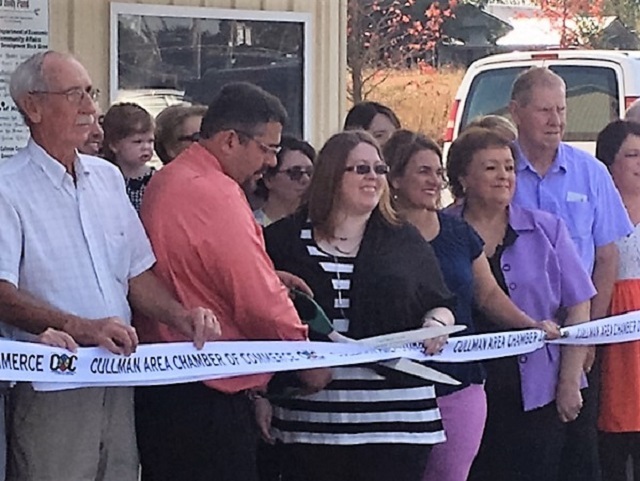 On Thursday morning, Warnick cut the ribbon to open Carpenter's Cabinet food bank in Holly Pond, in a ceremony attended by Mayor Herman Nail, other local officials, representatives of the Cullman Area Chamber of Commerce and North Alabama Food Bank (NAFB) and the Holly Pond High School Band. From the location behind Jack’s, staffers hope to serve 300 families in the next year with a combination of food from the North Alabama Food Bank (NAFB) and private donations. Is there a need? According to Laurel Moffatt, who addressed the audience on behalf of the NAFB, there most definitely is. She noted that approximately 4,800 children in Cullman County alone live in danger of going hungry. "When kids are hungry," she said, "it's harder for them to learn and grow." Laura Symonds is the director for the Holly Pond office of Carpenter's Cabinet, and she envisions the site becoming a multi-service community resource center. She says she would like to see reading classes (to promote literacy, the center will be distributing books to children), arts and crafts classes and Bible studies taking place there; but she is very clear about priorities. "Our first goal is to feed families in need." And that goal drives her to make this program successful. She said, "There's no reason there should be a hungry person within 20 miles." The center will receive 300 pounds of food per month from the NAFB, but is also seeking private donations. Each family served will receive a 35-pound box of groceries that can feed a typical family of four for seven days. Symonds says that for those wishing to contribute, certain items will be in constant need: peanut butter, jelly, macaroni & cheese, pasta, spaghetti sauce, rice and beans. The center could also use tables and chairs to replace currently borrowed equipment, and needs a refrigerator. Carpenter's Cabinet intends to hit the ground running. Its first food distribution is scheduled to take place next Thursday, Nov. 3, at 10 a.m. The food bank, which is located at 60 Finley Circle in Holly Pond, will be open on Thursdays from 10 a.m.-2 p.m. The Holly Pond center is not yet online, but the Carpenter's Cabinet main office in Falkville can be reached via its Facebook page www.facebook.com/TheCarpentersCabinet/.